INSTAPUTZ: Daniel Foster doesn't know much about history. 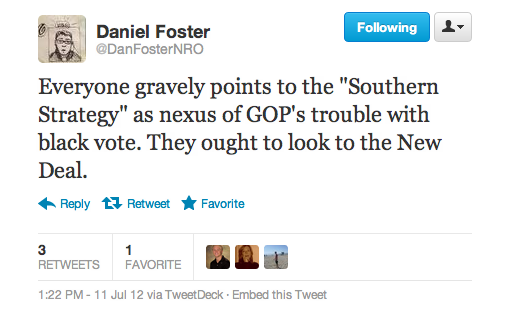 Daniel Foster doesn't know much about history. That thought must be comforting to wingnuts. I mean, if it were all about the New Deal, right-wingers could just chalk up the fact that blacks vote 90%+ Democratic in every election to a fundamental ideological difference (okay, let's leave aside that Republicans, including Ronald Reagan, used to support the New Deal--details schmetails). It wasn’t until Harry Truman garnered 77 percent of the black vote in 1948 that a majority of blacks reported that they thought of themselves as Democrats. Earlier that year Truman had issued an order desegregating the armed services and an executive order setting up regulations against racial bias in federal employment. Even after that, Republican nominees continued to get a large slice of the black vote for several elections. Dwight D. Eisenhower got 39 percent in 1956, and Richard Nixon got 32 percent in his narrow loss to John F. Kennedy in 1960. But then President Lyndon B. Johnson pushed through the landmark Civil Rights Act of 1964 (outlawing segregation in public places) and his eventual Republican opponent, Sen. Barry Goldwater, opposed it. Johnson got 94 percent of the black vote that year, still a record for any presidential election. The following year Johnson signed the 1965 Voting Rights Act. No Republican presidential candidate has gotten more than 15 percent of the black vote since. Oh, bummer Daniel! It was that pesky civil rights stuff. You know, the bills that conservatives like Barry Goldwater, Ronald Reagan, and William F. Buckley all opposed.